This entry was posted in Racing on October 5, 2011 by Steve Tilford. Fences have their places in society, but in general, I don’t like them much. I was thinking about riding my bike and playing when I was a kid and came to the conclusion that fences have really hindered a kids ability to play effectively. When I was a kid there were hardly any fences on any yards. It was a super way to take a shortcut across a block. Of course there were a couple houses that were off-limits, mainly because the occupants were a grouchy old couple or something like that, but we still cut through sometimes. I think it is difficult to play many of the nighttime games that children play when you only have front yards and the street as a playing field. We started getting fences here in Topeka when the city started enforcing the leash law on dogs. It was a boom for chain link fence companies. Everyone put it a 4 foot chain link fence. That wasn’t too much of a problem for most of us. We could get over a 4 foot chain link fence without hardly braking a stride. I guess we figured since those were our normal right-of-ways, we were grandfathered in, thus we just jumped them at will. But the kids that came along after me probably didn’t feel comfortable going into someones backyard, so eventually the fences did their jobs and delineated the property line. Now all the fences seem to be wooden and are for privacy too. Neighbors are strangers now. Now we, as a country are trying to decide if we should try to fence our whole country in. I don’t know the situation of our fence on the Mexican border. It seemed like a stupid idea at the time and even seems more stupid now. But then I read this article about thinking about building a fence along the Canadian border. I guess we are already flying two drone airplanes along the border spying and hindering all the bad guys from crossing into the US from Canadian. At least the drones are unarmed as of now. But when they say that they are thinking about building a fence along the border, I have to call stupid. Worse than stupid, insane. Fences didn’t work for me as a kid and surely won’t do a thing to keep “enemies” out of our country. Especially all those Canadians! 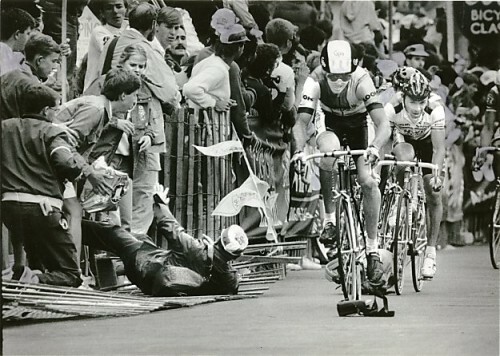 I’ve ran into a few experiences where fencing has been used to try to segregate bike racing from the spectators. One time we showed up to the Fatboy Criterium in Scottsdale and the fencing company had encircled nearly the whole course with 8 foot chain link fence. It was horrible. People with their faces pressed up to the fence, hardly seeing any of the race. The riders called it the roller dome. And the Rock Island Criterium had the same idea, but they bought the fencing. They tried to use a 6 foot, welded wire fence for years. All it did was drive the spectators away. So, in summary, I think fences are pretty good for one thing: keeping our pets and other animals in a confined area. They are lousy for keeping people in or out. I’d just as well not have them around. I'm all about art, but I don't even like this fence much. Snow fencing should only be used for snow, not for people. I wonder if Alan hit the camera here. Heard this on NPR the other day. The “Cross my Path” segment reminded me of your thoughts on animals. After reading this I had visions of the Berlin wall. That may have been to keep people in but…whats the difference? the tour of tobago had some fun spiked fences segregating the course from the cattle…. The EU was establish to foster economic growth and border permeability, yet the US wants to wall off/in one of the least worrisome neighbors on the planet. Sheer genius. To that I respond: what about the tail between your legs. From a race standpoint the snow fencing on some of the summits at the Pro Challenge proved necessary after overzealous fans took out a rider or two, but mostly I agree. 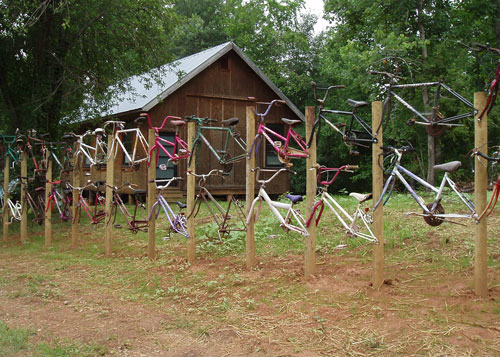 Im thinking of building a fence in my backyard. Mainly to keep my dog from running away. She doesnt like being put on a leash everytime sh goes out but she is a runner! Actually this fence would provide freedom. Fences are safeguards for property owners from our sue-happy neighbors. your comment about no one knowing their neighbors now reminds me of something I studied in some of my Anthropology classes about the shifting in the landscape post WWII and the invention of TV where people moved from building houses closer together with large front porches where they would gather in the evenings to fenced in backyards, small front porches, and large decks in the backyard. people could drive into their garages in the evening and emerge in the morning having little or no contact with neighbors. privacy began to be more important than community. Too bad, really, in my opinion. Fences can be a very good thing. I have a swimming pool in my backyard and my neighbors all have small children, the one on the south has 8 kids, others have two or three. I spent a lot of money putting up an 8-foot privacy fence so I wouldn’t come home some night to find someones’ kid at the bottom of the pool. does a country not have a right/duty to protect its citizenry? You have complained about rules on your blog, and you acknowledged common sense rules are a good thing such as ranking riders so you as a competitor with a good chance at a title is not stuck in the last row behind 120 freds. However when it comes to a country protecting its citizenry and showing that its laws should be respected you are in favor of a different approach. What about all the people who follow the rules? is it fair to shove them aside? Of course not. i favor that we should err on the side of the people who follow the rules & the law. Bob-Obviously we have different ideologies here. Plus, I’m not even sure what you’re getting at. I’m all for rules in society. I’m not sure what that has to do with fences. If you think that building fences is the most cost effective and best way to protect our citizens, then I guess that is your opinion. I don’t agree with it. Like I said before, I don’t think fences do a very good job at keeping people in and/or out. Especially really long ones that are going to be nearly impossible to watch. It’s not effective and a complete waste of time and money. Oh, and the best part of Moline was where there were no fences, 90% of the course. Where the people were having picnics in their yards watching the race. For those of us with children, fences are unfortunately almost a requirement these days. Unfamiliar kids from all around tend to end up in the backyard of whoever doesn’t have a fence, often tearing up plants or parts of houses. Parents don’t seem to teach their kids respect for others’ property like we did a generation ago. We welcome other kids to use out property as a cut through though. Don’t mind a bit. One other opinion-the fence on the Canadian border is not there to keep the Canadians out. It’s to keep the muslim terrorists out. They try to get into the US any way they can. My memories of Moline same as yours Steve…very little fence. I miss that course, one of my favorites. Seems like fences are only good for keeping in dogs, kids, and segregation. As for the argument involving borders, segregation has never been a long term solution to problems within a state or two bordering states. Walling and separating yourself from a problem only reinforces those issues at their core and deters any outside competing ideas that may even be beneficial. Way to go on this one Steve. Most of the guys on my high school x-country team could handle 8′ chain link with 3 strands of barbed wire on top in under 30 sec. Of course, none of us were carrying satchel charges at the time. The idea of a fence along the “entire” Mexican border is a sad joke. Check this picture and tell me, first, where are they going to put the fence, and second, how much it will cost. 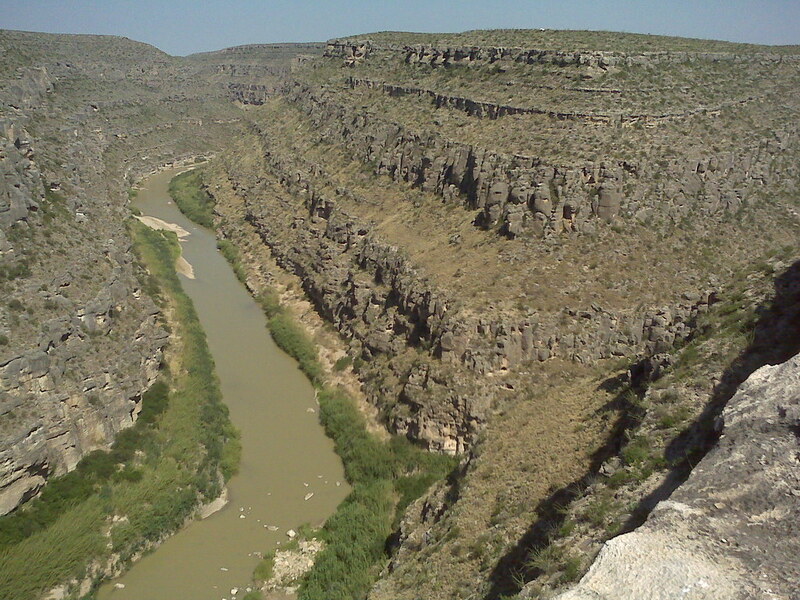 That’s an 800 foot deep canyon to the Rio Grande, with an equally deep side canyon coming into it. This kind of terrain goes on for hundreds and hundreds of miles.